Repost from October 2015–a tribute to Mother Teresa. Behold, this was the guilt of your sister Sodom: she and her daughters had arrogance, abundant food and careless ease, but she did not help the poor and needy. Thus they were haughty and committed abominations before Me. Therefore I removed them when I saw it. Ezekiel 16: 49-50. When I teach students to write, I always tell them to save the most important point for last. In Seven Women and the Secret of their Greatness, Eric Metaxas saved the most profound story for the end of his book, the story of Mother Teresa. I don’t remember where I was when I learned about the death of Mother Teresa even though she died on the same day in 1997 that Princess Diana died. Maybe that’s why I don’t remember. It seems odd now because Mother Teresa was one of the most iconic figures of the second half of the twentieth century. I knew that she ministered in Calcutta, India, that she lived a modest life of self-sacrifice. That’s who she was in a nutshell, but she was so much more as Metaxas points out. Mother Teresa’s own mother served those in need around her, modeling love for one’s neighbors in full view of her children. This mother surely could not have imagined the difference her youngest child would someday make in the world. 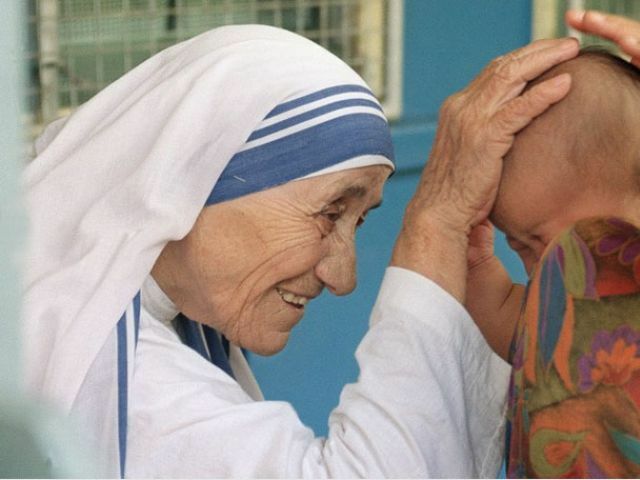 Mother Teresa would not just minister in India. She would open the first hospice in New York City for AIDS victims. She would chastise President Clinton publicly and in person for his support of abortion. She would proclaim Christ to the royal family of Norway and the world as she accepted the Nobel Peace Prize in 1979. But decades earlier, Mother Teresa was the very first nun in her order. She had been a teacher in another order when she sensed God calling her to live among the poor, to teach them, feed them, and provide medical care for them. She received special permission to form this new order, the Missionaries of Charity, but its inception involved her traveling alone to India by train and immersing herself in the community of Calcutta as the lone nun wearing her signature white habit and blue striped sari. She set up a school, taught the alphabet, needlework, and catechism along with lessons in hygiene. Following in her own mother’s footsteps, she and her students would visit the sick after lessons. Eventually another nun joined her, then another. The work grew. There was miraculous provision. More than once. Pervasive and pernicious sexual immorality in Sodom contributed to that city’s doom. But we shouldn’t dismiss her other faults: arrogance, being overfed, careless ease, neglect of the needy, haughtiness. As the morality of our culture declines, we can overcome evil with good. But we can’t do it while sitting in our easy chairs and pointing fingers. There is a hunger for more than food. Giving ourselves away fills others. It feeds our own spirits as well.